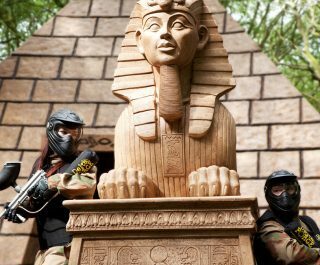 The Delta Force Cobham Paintball Centre in Surrey is our flagship paintball centre, conveniently located to the south of London just off the M25 at Junction 10. 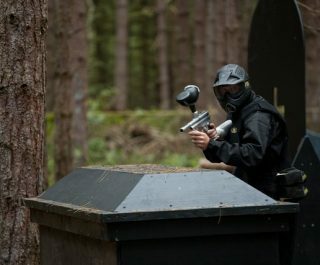 This paintball centre is a great option for people living in Woking, Guildford, Farnham, Fulham, Haslemere and Ripley. The surrounding Effingham Forest provides the ideal conditions for the ultimate paintball experience in this county, with six varied paintball paintball game zones including the iconic Tomb Raider map – complete with a giant pyramid, and the London Apocalypse paintball game zone – featuring famous landmarks from the country’s capital, with Big Ben dominating the vista. 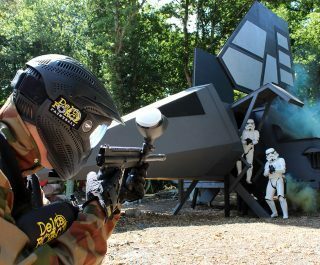 What’s more, Delta Force Paintball Surrey is also home to the only intergalactic themed paintball game zone in the UK – Space Warz. If that wasn’t enough the basecamp has a helicopter at the entrance, taken from the set of the BBC series Silent Witness and a second helicopter is in the central base camp direct from the set of Tom Cruise’s time travel movie Edge of Tomorrow. So come on down and check the centre out. Book the Surrey paintballing centre now by visiting the paintball booking page or calling our events team 24 hours a day, 7 days a week on 0203 869 9301.